2001-08-16 Assigned to LORD CORPORATION reassignment LORD CORPORATION ASSIGNMENT OF ASSIGNORS INTEREST (SEE DOCUMENT FOR DETAILS). Assignors: CASTER, KENNETH C., TOKAS, EDWARD F.
A method for bonding a material to a fibrous substrate surface that includes providing a catalyst at the fibrous substrate surface, then contacting that surface with a material that undergoes a metathesis reaction and then bonding the fibrous substrate surface to a second substrate. There are two embodiments of this method—a coating process and an adhesive process. In the coating embodiment, the metathesizable material is contacted with the catalyst on the substrate surface so that it undergoes metathesis polymerization to form the coating. The adhesive process includes (a) providing a catalyst at the fibrous substrate surface, (b) contacting the catalyst on the fibrous substrate surface with a metathesizable material so that the metathesizable material undergoes a metathesis reaction; and (c) contacting the fibrous substrate surface with a second substrate surface. This application is continuation-in-part of U.S. Ser. No. 09/209,706, filed Dec. 11, 1998. It would be advantageous under certain circumstances to bond the elastomer substrate surface to the other substrate surface after the elastomer substrate has been fully cured or vulcanized. This post-vulcanization bonding is sometimes referred to in the art as cold bonding. However, post-vulcanization bonding is one noticeable area in which adequate adhesive bonding is lacking, particularly when bonding to substrates made from different materials, especially metal or low surface energy materials. For example, cured ethylene-propylene-diene terpolymer rubber (“EPDM”) has a low surface energy that makes wetting difficult and it includes a relatively low amount of sites such as carbon-carbon double bonds that are useful in subsequent bonding. Adhesive bonding to post-vulcanized or cured elastomers has met with limited success. Cyanoacrylate adhesives are used for post-vulcanization bonding but these suffer from well known problems in more demanding industrial applications that are subjected to harsh environmental conditions. For example, cyanoacrylates suffer from poor heat resistance, solvent resistance and flexibility (see Handbook of Adhesives, edited by Skeist, I., pp. 473- 476 (3d ed. 1990)). Other post-vulcanization adhesives are solvent-based and require high temperature and long curing times. Epoxy or urethane adhesives typically require elastomer surface pretreatment such as with oxidizing flames, oxidizing chemicals or electrical/plasma discharges in order to improve bonding. These pretreatment methods, however, are costly and time consuming. According to further embodiment of the invention, the method can be used to make multilayer structures for either coating or adhesive applications. In this embodiment, the catalyst and the metathesizable material are initially applied to the first substrate surface as described above. The catalyst site, however, propagates within the coating layer where it remains as a stable active site for a subsequent reaction with a metathesizable material. In other words, active catalyst remains on the new surface that has been created from the metathesizable material. A second metathesizable material then is contacted with this “living” surface and another new layer is created. This process can be repeated until the concentration of active catalyst remaining on the surface has diminished to a level that is no longer practically useful. This method is illustrated in FIG. 4. It should be noted that the catalysts typically are not consumed or deactivated and thus there may be no need for excess catalyst. FIG. 5 illustrates the fiber processing described in Example 34. The bonding or coating adhering that takes place according to the present invention occurs via a metathesis reaction. Various metathesis reactions are described in Ivin, K. J. and Mol, J. C.,  Olefin Metathesis and Metathesis Polymerization (Academic Press 1997). 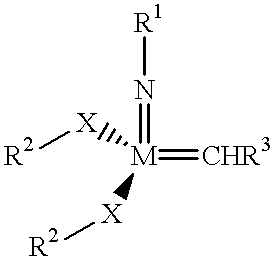 The metathesis reaction could be a cross-metathesis reaction, an ADMET, a ring-closing metathesis reaction or, preferably, a ROMP. It should be recognized that the surface metathesis polymerization that occurs in this invention is very different than bulk (including reaction injection molding), emulsion or solution metathesis polymerization in which a metathesizable monomer and a catalyst are mixed together into a single composition to effect the metathesis reaction. Bulk metathesis polymerization, particularly reaction injection molding, of norbornene monomer for producing molded articles made of the resulting polynorbornene is known. For example, U.S. Pat. No. 4,902,560 teaches a method for making a glass fiber-reinforced polydicyclopentadiene article that involves saturating an uncoated woven glass fabric with a polymerizable liquid that includes dicyclopentadiene monomer and catalyst, subjecting the saturated fabric to reaction injection molding and post-curing the resultant structure. According to the present invention, the resulting metathesis polymer forms a filmogenic adhesive or coating rather than a molded article. wherein X is CH 2, CHR3, C(R3)2, O, S, N—R3, P—R3, O═P—R3, Si(R3)2, B—R3 or As-R3; each R1 is independently H, CH2, alkyl, alkenyl (such as vinyl or allyl), cycloalkyl, cycloalkenyl, aryl, alkaryl, aralkyl, halogen, halogenated alkyl, halogenated alkenyl, alkoxy, oxyalkyl, carboxyl, carbonyl, amido, (meth)acrylate-containing group, anhydride-containing group, thioalkoxy, sulfoxide, nitro, hydroxy, keto, carbamato, sulfonyl, sulfinyl, carboxylate, silanyl, cyano or imido; R2 is a fused aromatic, aliphatic or hetero cyclic or polycyclic ring; and R3 is alkyl, alkenyl, cycloalkyl, cycloalkenyl, aryl, alkaryl, aralkyl or alkoxy. The carbon-containing R groups may have up to about 20 carbon atoms. The amount of metathesizable material applied to a substrate surface should be sufficient to form a continuous film in the case of a coating or provide adequate bonding in the case of an adhesive. The amount varies depending upon a variety of factors including substrate type, application and desired properties but it could range from 0.01 to 1,000, preferably, 0.1 to 100 and more preferably 0.3 to 25 mg/cm 2 substrate surface area. There are numerous known metathesis catalysts that might be useful in the invention. Transition metal carbene catalysts are well known. Illustrative metathesis catalyst systems include rhenium compounds (such as Re 2O7/Al2O3, ReCl5/Al2O3, Re2O7/Sn(CH3)4, and CH3ReO3/Al2O3—SiO2); ruthenium compounds (such as RuCl3, RuCl3(hydrate), K2[RuCl5-H2O], [Ru(H2O)6](tos)3 (“tos” signifies tosylate), ruthenium/olefin systems (meaning a solution or dispersion of preformed complex between Ru and olefin (monomer) that also includes a β-oxygen in the presence or absence of a soluble or dispersed polymer where the polymer can be an oligomer or higher molecular weight polymer prepared by metathesis or other conventional polymerization synthesis), and ruthenium carbene complexes as described in detail below); osmium compounds (such as OsCl3, OsCl3(hydrate) and osmium carbene complexes as described in detail below); molybdenum compounds (such as molybdenum carbene complexes (such as t-butoxy and hexafluoro-t-butoxy systems), molybdenum pentachloride, molybdenum oxytrichloride, tridodecylammonium molybdate, methyltricaprylammonium molybdate, tri(tridecyl)ammonium molybdate, and trioctylammonium molybdate); tungsten compounds (such as tungsten carbene complexes (such as t-butoxy and hexafluoro-t-butoxy systems), WCl6 (typically with a co-catalyst such as SnR4® signifies alkyl) or PbR4), tungsten oxytetrachloride, tungsten oxide tridodecylammonium tungstate, methyltricaprylammonium tungstate, tri(tridecyl)ammonium tungstate, trioctylammonium tungstate, WCl6/CH3CH2OH/CH3CH2AlCl2, WO3/SiO2/Al2O3, WCl6/2,6-C6H5—C6H5OH/SnR4, WCl6/2,6-Br-C6H3OH/SnR4, WOCl4/2,6-C6H5-C6H5OH/SnR4, WOCl4/2,6-Br—C6H3OH/SnR4); TiCl4/aluminum alkyl; NbOx/SiO2/iso-butyl AlCl2; and MgCl2. As indicated above, some of these catalysts, particularly tungsten, require the presence of additional activator or initiator systems such as aluminum, zinc, lead or tin alkyl. Preferred catalysts are ruthenium compounds, molybdenum compounds and osmium compounds. wherein M is Os, Ru or Ir; each R 1 is the same or different and is H, alkenyl, alkynyl, alkyl, aryl, alkaryl, aralkyl, carboxylate, alkoxy, allenylidenyl, indenyl, alkylalkenylcarboxy, alkenylalkoxy, alkenylaryl, alkynylalkoxy, aryloxy, alkoxycarbonyl, alkylthio, alkylsulfonyl, alkylsulfinyl, amino or amido; X is the same or different and is either an anionic or a neutral ligand group; and L is the same or different and is a neutral electron donor group. The carbon-containing substituents may have up to about 20 carbon atoms. Preferably, X is Cl, Br, I, F, CN, SCN, or N3, O-alkyl or O-aryl. Preferably, L is a heterocyclic ring or Q(R2)a wherein Q is P, As, Sb or N; R2 is H, cycloalkyl, alkyl, aryl, alkoxy, arylate, amino, alkylamino, arylamino, amido or a heterocyclic ring; and a is 1, 2 or 3. 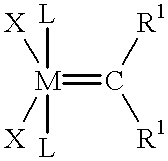 Preferably, M is Ru; R1 is H, phenyl (“Ph”), —CH═C(Ph)2, —CH═C(CH3)2 or —C(CH3)2Ph; L is a trialkylphosphine such as PCy3 (Cy is cyclohexyl or cyclopentyl), P(isopropyl)3 or PPh3; and X is Cl. Particularly preferred catalysts include tricyclohexyl phosphine ruthenium carbenes, especially bis(tricyclohexylphosphine)benzylidene ruthenium(IV) dichloride (designated herein by RuCl2(PCy3)2═CHPh). 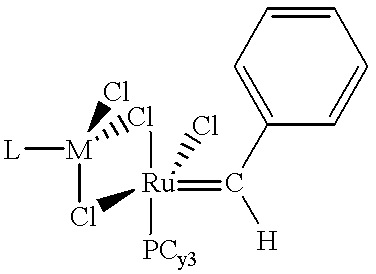 Such ruthenium and osmium carbene catalysts are described, for example, in U.S. Pats. No. 5,312,940 and 5,342,909, both incorporated herein by reference; Schwab, P.; Grubbs, R. H.; Ziller, J. W., Journal of the American Chemical Society, 1996, 118, 1 00; Schwab, P.; France, M. B., Ziller, J. W.; Grubbs, R. H., Angew. Chem. Int. 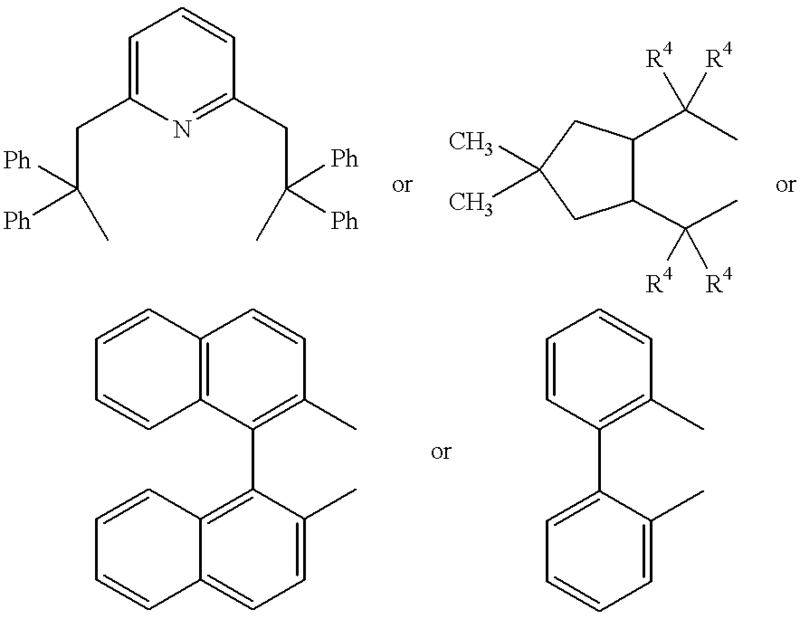 Ed., 1995, 34, 2039; and Nguyen, S. T.; Grubbs, R. H., Journal of the American Chemical Society, 1993, 115, 9858. Useful catalysts are described in articles such as Ahmed, M.; Garrett, A. G. M.; Braddock, D. C.; Cramp, S. M.; Procopoiou, P. A.  Tetrahedron Letters 1999, 40, 8657; Olivan, M.; Caulton, K. G. J. Chem. Soc., Chem. Commun. 1997, 1733; Amoroso, D.; Fogg, D. E. Macromolecules 2000, 33, 2815; Fürstner, A.; Hill, A. F.; Liebl, M.; Wilton-Ely, J. D. E. T. J. Chem. Soc., Chem. Commun., 1999, 601; Robson, D. A.; Gibson, V. C.; Davies, R. G.; North, M. Macromolecules 1999, 32, 6371; Schwab, P.; France, M. B.; Ziller, J. W.; Grubbs, R. H. Angew. Chem. Int. Ed. 1995, 34, 2039; Schwab, P.; Grubbs, R. H.; Ziller, J. W. J. Am. Chem. Soc. 1996,118, 100; Ulman, M.; Belderrain, T. R.; Grubbs, R. H. Tetrahedron Lett. 2000,4689; M. Scholl; S. Ding; C. W. Lee; Grubbs, R. H. Organic Lett. 1999, 1, 953; Scholl, M.; Trmka, T. M.; Morgan, J. P.; Grubbs, R. H. Tetrahedron Lett. 1999, 40, 2247; Belderrain, T. R.; Grubbs, R. H. Organometallics 1997, 16, 4001; Ulman, M.; Belderrain, T. R.; Grubbs, R. H. Tetrahedron Lett. 2000, 4689; Sanford, M. S.; Henling, L. M.; Day, M. W.; Grubbs, R. H. Angew. Chem. Int. Ed. 2000,39,3451; Lynn, D. M.; Mohr, B.; Grubbs, R. H.; Henling, L. M.; Day, M. W. J. Am. Chem. Soc. 2000, 122, 6601; Mohr, B.; Lynn, D. M.; Grubbs, R. H. Organometallics 1996, 15,4317; Nguyen, S. T.; Grubbs, R. H.; Ziller, J. W. J. Am. Chem. Soc. 1993, 115, 9858; Weskamp, T.; Schattenmann, W. C.; Spiegler, M.; Herrmann, W. A. Angew. Chem. Int. Ed. 1998, 37, 2490; Hansen, S. M.; Volland, M. A. O.; Rominger, F.; Eisentrager, F.; Hofmann, P. Angew. Chem. Int. Ed. 1999, 38, 1273; J. S. Kingsbury, J. S.; Harrity, J. P. A.; Bonitatebus, P. J.; Hoveyda, A. H. J. Am. Chem. Soc. 1999,121, 791; Wolf, J.; Stuer, W.; Grunwald, C.; Werner, H.; Schwab, P.; Schulz, M. Angew. Chem. Int. Ed. 1998, 37, 1124.
wherein M is Ru, Os or Rh. Such a catalyst is disclosed in Dias, E. L.; Grubbs, R. H.,  Organometallics, 1998, 17, 2758. (wherein R 4 is phenyl, naphthyl, binaphtholate or biphenolate); and R3 is —C(CH3)2C6H5. Particularly preferred are 2,6-diisopropylphenylimidoneophylidene molybdenum (VI) bis(hexafluoro-t-butoxide) (designated herein as “MoHFTB”) and 2,6-diisopropylphenylimidoneophylidene molybdenum (VI) bis(t-butoxide) (designated herein as “MoTB”). Such molybdenum catalysts are described in Bazan, G. C., Oskam, J. H., Cho, H. N., Park, L. Y., Schrock, R. R., Journal of the American Chemical Society, 1991, 113, 6899 and U.S. Pat. No. 4,727,215. The catalyst can be delivered at the surface of the substrate by any method. Typically the catalyst is applied in a liquid composition to the substrate surface. The catalyst in its substantially pure form may exist as a liquid or solid at normal ambient conditions. If the catalyst exists as a liquid, it may be mixed with a carrier fluid in order to dilute the concentration of the catalyst. If the catalyst exists as a solid, it may be mixed with a carrier fluid so that it can be easily delivered to the substrate surface. Of course, a solid catalyst may be applied to the surface without the use of a liquid carrier fluid. The preferred RuC 2(PCy3)2═CHPh, homobimetallic ruthenium, MoHFTB and MoTB catalysts exist as solids at normal ambient conditions and thus are usually mixed with carrier fluids. The catalyst composition could also be considered a primer in the sense that it primes the substrate surface for subsequent application of a coating or an adhesive. The amount of catalyst applied to the substrate should be sufficient to effect the metathesis polymerization. The amount varies depending upon a variety of factors including the application, substrate type and desired properties but it could range from 0.001 to 10, preferably, 0.01 to 5 and more preferably 0.1 to 5 mg/cm 2 substrate surface area. The elastomer component of TPE is made from olefinic rubbers such as EPM, EPDM, butyl rubber, copolymer of a C 4-7 isomonoolefin and a para-alkylstyrene, natural rubber, synthetic polyisoprene, polybutadiene, styrene-butadiene copolymer rubber, nitrile rubber, polychloroprene and mixtures thereof. A catalyst solution was prepared by dissolving 0.021 g of RuCl 2(PCy3)2═CHPh in 1.5 ml of CH2Cl2. Three grit-blasted steel coupons were prepared by pipetting 0.5 ml of the catalyst solution via syringe onto each coupon to just cover its surface (34.9 mm×25.4 mm) and the solvent allowed to evaporate for three to four minutes in the open laboratory atmosphere. This gave >7 mg of RuCl2(PCy3)2=CHPh per coupon. The metal coupons were usually washed with acetone and dried prior to application of catalyst solution, but this was not required. In this example, the coupons were unwashed. EPDM rubber strips were prepared by washing the bonding surface (34.9 mm×25.4 mm) with acetone, drying at room temperature for 3 to 4 minutes, and then applying via syringe 0.03 ml of ENB to each coupon and spreading it evenly with the needle tip. The catalyst-coated metal coupon was immediately placed on top of the ENB-coated EPDM strip so that both treated surfaces contacted each other and a weight of approximately 100 gm was placed on top of the mated area. The samples sat at ambient conditions overnight. All the samples could not be pulled apart by hand. They were evaluated using a 180°0 peel test on an Instron and showed only EPDM rubber tear on failure. A total of 12 samples were tested and the mean load at maximum load was 273.04 (N) and the mean energy to break was 37.87 (J). This testing was performed as preliminary screening to evaluate different application methods for bonding EPDM-to-metal. The process described in Example 1 was used to apply the RuCl 2(PCy3)2═CHPh catalyst solution or ENB to either a grit-blasted steel coupon or EPDM rubber strip. The results are shown below in Table 1. Based on these results, it appears that the best bonding method occurred when the catalyst was applied to the metal and the ENB was applied to the EPDM. In Table 1 the substrate type listed under the catalyst or monomer is the substrate to which the catalyst or monomer is applied. metal Rubber good Could not pull apart by hand in tension. rubber was good, poor to metal. EXAMPLE 4 Application of Catalyst to Substrate by Brush Process. A catalyst solution was prepared by dissolving 0.021 g of RuCl 2(PCy3)2═CHPh to 1.5 ml of CH2Cl2 in a screw-cap vial under N2. This solution was applied by brush to three grit-blasted steel coupons over the surface to be bonded (34.9 mm×25.4 mm) and the solvent allowed to evaporate in the open laboratory atmosphere during the brushing process, thus leaving the catalyst powder evenly distributed over the metal coupon surface. After drying, all prepared samples were weighed to determine the amount of catalyst on the surface, which was 5.8±1.8 mg per coupon. When the first-made solution was depleted, another batch of fresh catalyst solution was prepared as described above. A total of 12 samples were prepared in this manner. EPDM rubber strips were prepared by washing the bonding surface (34.9 mm×25.4 mm) with acetone, drying at room temperature for 3 to 4 minutes, and then applying via syringe 0.03 ml of ENB to each coupon and spreading it evenly with the needle tip. The catalyst-coated metal coupon was immediately placed on top of the ENB-coated EPDM strip so that both treated surfaces contacted each other and a weight of approximately 100 gm was placed on top of the mated area. The samples sat at ambient conditions overnight. The next morning, no failure was observed on attempted pulling the samples apart by hand. They were evaluated using a 180° peel test on an Instron and showed evenly distributed rubber tear on the EPDM on failure. A total of 12 specimens were tested and showed a mean load at maximum load of 283.87 (N) and mean energy to break of 41.72 (3). A catalyst solution was prepared by dissolving 0.015 g of RuCl 2(PCy3)2═CHPh and 0.006 g of dodecyltrimethylammonium bromide (“DTAB”) surfactant (0.488 w/w %) in 1.21 g of water. The aqueous catalyst solution was brushed onto two grit-blasted metal coupons using the procedure described in Example 4 except that the coupons were heated on a hot-plate at 40° C. to aid in water removal. The coupons were cooled to room temperature and bonded to EPDM with 0.04 ml of ENB as described in Example 4. The next morning the samples could be pulled apart by hand. In another example, a catalyst solution was prepared from 0.0272 g of RuCl 2(PCy3)2═CHPh and 0.0024 g of DTAB (0.068 w/w %) in 3.5 g of water. The aqueous catalyst solution was brushed onto three grit-blasted metal coupons as described above, cooled to room temperature, and bonded to EPDM with 0.04 ml of ENB as described in Example 4. They were evaluated using a 180° peel test on an Instron and showed rubber tear on the EPDM on failure. A total of three specimens were tested and showed a mean load at maximum load of 215.07 (N) and mean energy to break of 23.09 (J). EXAMPLE 8 Application of Catalyst to Substrate by Spray Process. A catalyst solution was prepared by dissolving 0.5 g of RuCl 2(PCy3)2═CHPh in 20 ml of CH2Cl2. The catalyst solution was sprayed onto 12 grit-blasted steel coupons in a sweeping pattern until even-appearing coverage of the surface to be bonded (34.9 mm×25.4 mm) was obtained. The solvent was allowed to evaporate for 1.5 hours in the open laboratory atmosphere. After drying, all prepared samples were weighed to determine the amount of catalyst on the surface, which was 9.0±0.95 mg per coupon. EPDM rubber strips were prepared by washing the bonding surface (34.9 mm×25.4 mm) with acetone, drying at room temperature for 3 to 4 minutes, and then applying via syringe 0.06 ml of ENB to each coupon and spreading it evenly with the needle tip. The catalyst-coated metal coupon was immediately placed on top of the ENB-coated EPDM strip so that both treated surfaces contacted each other and a weight of approximately 100 g was placed on top of the mated area. The samples sat at ambient conditions overnight. The next morning, all samples could not be pulled apart by hand and showed only EPDM rubber tear after analysis on an Instron. A total of 12 samples were tested and displayed a mean load at maximum load of 352.47 (N) and a mean energy to break of 61.23 (J). A catalyst solution was prepared by dissolving 0.030 g of RuCl 2(PCy3)2═CHPh in 2.5 ml of CH2Cl2. The catalyst solution was applied to steel Q-panel, aluminum, and chromated aluminum metal coupons and the metal coupons were bonded to EPDM rubber strips with 0.04 ml of ENB monomer per coupon as described in Example 4. Three separate but identical batches of catalyst solution were used to prepare the metal coupons, which resulted in 7.3±1.2 mg catalyst per coupon after weighing. The specimens were analyzed on an Instron with a 180° peel test. All three metals showed a very small amount of rubber tear with adhesive failure as the primary failure mode as most of the ENB polymer film was attached to the rubber on failure. Higher bond strengths were observed with the chromated aluminum surfaces. A catalyst solution was prepared by dissolving 0.030 g of RuCl 2(PCy3)2═CHPh in 3.0 ml of CH2Cl2. The catalyst solution was applied to grit-blasted steel coupons and the steel coupons were bonded to three samples of four types of Santoprene® (101-64, 201-64, 201-87 and 8201-90) with 0.08 ml of ENB monomer per coupon as described in Example 4. Weighing revealed on average that 9.4±1.2 mg of catalyst was contained per coupon. The rubber surface was sanded prior to application of monomer for each type. The bonded specimens were analyzed on the Instron with the 180° peel test and the results are shown below in Table 3. All three samples of both softer rubbers, 101-64 and 201-64, showed excellent rubber tear while the stiffer rubbers, 201-87 and 8201-90, showed no rubber tear and adhesive failure was prominent with most of the ENB polymer film attached to the rubber after peeling these specimens apart. Good bond strength data were observed for all specimens. Bonded Sanded Santoprene ® Specimens. RuCl 2(PCy3)2═CHPh was applied to grit-blasted steel coupons and bonded with 0.10 ml of ENB monomer per coupon using the process described in Example 4. Four natural rubber samples were prepared. Two samples were sanded and two samples remained unsanded. The mated specimens were allowed sit over a two day period. On the third day, the two specimens prepared from the sanded natural rubber pulled apart by hand. A thin ENB polymer film was left on the natural rubber strip and some rubber tear was observed. The two specimens prepared from unsanded natural rubber could not be pulled apart by hand and were analyzed on the Instron using a 180° peel test. The bonded specimens had a mean load at maximum load of 183.14 (N) and a mean energy to break of 12.20 (J). Rubber tear was observed for the sample with the higher values. A catalyst solution was prepared by dissolving 0.021 g of 2,6-diisopropyl-phenylimido neophylidene molybdenum (VI) bis-t-butoxide (MoTB) in 2 ml of CH 2Cl2. The catalyst solution was applied to grit-blasted steel coupons and then the steel coupons were bonded to EPDM rubber strips with 0.08-0.09 ml of ENB monomer per coupon as described in Example 4. Because of catalyst sensitivity to air and moisture, all handling of rubber and metal coupons and catalyst solutions was performed in a glove box under an argon atmosphere. Once bonded, the samples were kept in the glove box until mechanical tests were performed. The original grit-blasted metal and rubber coupons had been stored in the glove box for several months to ensure complete removal of any water or oxygen contamination. This was later found to be unnecessary as bonding was observed even with samples that had only a few hours residence time in the glove box. It was noted that within 5-10 seconds after mating the two surfaces, the coupons could not be moved around on top of each other suggesting that polymerization had occurred. All specimens were analyzed on an Instron using the 180° peel test. The results are means for two separate data sets: the original two bonded specimens (long residence time in the glove box)—mean load at maximum load of 46.57 (N) and mean energy to break of 1.54 (J) and three new specimens (surfaces were thoroughly washed with acetone prior to placing in the glove box followed by washing with CH2Cl2 in the box prior to addition of monomer)—mean load at maximum load of 139.26 (N) and mean energy to break of 11.12 (J). Some rubber tear was observed on all specimens except one. EXAMPLE 13 EPDM-to-Grit-Blasted Steel Bonding using Homobimetallic Ruthenium Catalyst. A catalyst solution was prepared by dissolving 0.030 g of RuCl 2(p-cymene)-RuCl2(PCy3)2═CHPh in 3.1 ml of CH2Cl2. The catalyst solution was applied to grit-blasted steel coupons and then the steel coupons were bonded to EPDM rubber strips with 0.08 ml of ENB monomer per coupon as described in Example 4. The mated specimens were analyzed on the Instron using a 180° peel test. The bonded specimens had a mean load at maximum load of 226.60 (N) and a mean energy to break of 26.78 (J). Rubber tear was observed for all specimens. EXAMPLE 14 EPDM-to-Grit-Blasted Steel Bonding using DCPD as Monomer. A catalyst solution was prepared by dissolving 0.031 g of RuCl 2(PCy3)2═CHPh in 3.2 ml of CH2Cl2. The catalyst solution was applied to grit-blasted steel coupons and the steel coupons then were bonded to EPDM rubber strips with DCPD monomer as described in Example 4. The procedure for application of the DCPD varied slightly from that with ENB. The EPDM surface was washed with acetone prior to application of DCPD monomer, which required gentle melting of the distilled dicyclopentadiene with a heat gun, pipetting the liquid onto the EPDM surface and spreading the liquid with a pipette. On cooling, the DCPD solidified. Once the monomer was applied, the DCPD coated surface was gently heated with a heat gun to melt the solid; the metal and rubber parts were immediately mated and weighted down with approximately 100 grams. The mated specimens were analyzed on the Instron using a 180° peel test. The bonded specimens had a mean load at maximum load of 290.78 (N) and a mean energy to break of 44.44 (3). Rubber tear was observed for all specimens. EXAMPLE 15 EPDM-to-Grit-Blasted-Steel Bonding using Methylidenenorbornene as Monomer. A catalyst solution was prepared by dissolving 0.031 g of RuCl 2(PCy3)2═CHPh in 3.2 ml of CH2Cl2, applied to three grit-blasted steel coupons, and then the steel coupons were bonded to EPDM with 0.10 ml of methylidenenorbornene monomer per coupon as described in Example 4. The mated specimens were analyzed on the Instron using a 180° peel test. The bonded specimens had a mean load at maximum load of 40.55 (N) and a mean energy to break of 1.48 (J). A catalyst solution was prepared by dissolving 0.030 g of RuCl 2(PCy3)2═CHPh in 2 ml of CH2Cl2. The catalyst solution was applied to two EPDM strips. Each catalyst-coated EPDM strip was bonded to another EPDM strip with 0.02 ml of ENB monomer per strip as described in Example 1. The EPDM rubber strips were washed with acetone and allowed to dry prior to application of either catalyst solution or ENB monomer. Two strips were bonded in a lap-shear configuration surface (34.9 mm×25.4 mm); examination of the specimens on the next day revealed they could not be pulled apart by hand. They were then analyzed by a lap shear tensile test on an Instron after three months of standing at ambient conditions and showed an average load at break of 419.42 (N). A catalyst solution was prepared by dissolving 0.027 g of RuCl 2(PCy3)2═CHPh in 2.5 ml of CH2Cl2. The catalyst solution was applied to three EPDM strips. Each catalyst-coated EPDM strip was bonded to an EPDM strip with 0.07-0.10 ml of ENB monomer per strip as described in Example 4. The EPDM rubber strips were washed with acetone and allowed to dry prior to application of either catalyst solution or ENB monomer. Six specimens were bonded in 180° peel test mode. Three were sanded before bonding. All specimens bonded and could not be pulled apart by hand and were analyzed on an Instron using a 180° peel test. The sanded specimens had a mean load at maximum load of 166.51 (N) and a mean energy to break of 25.56 (3); and the unsanded specimens had a mean load at maximum load of 176.16 (N) and a mean energy to break of 26.97 (J). Failure analysis showed that the sanded specimens had rubber tear but the unsanded specimens had deeper rubber tear with chunks torn away. Two separate catalyst solutions were prepared to self-bond unsanded and sanded EPDM specimens. The first solution was prepared by dissolving 0.0216 g of 2,6-diisopropylphenylimido neophylidene molybdenum (VI) bis-t-butoxide (MoTB) in 2 ml of CH 2Cl2. The catalyst solution was applied to two unsanded EPDM rubber strips that were then bonded to EPDM rubber strips with 0.08 ml of ENB monomer per coupon as described in Example 12. The second solution was prepared by dissolving 0.0211 g of 2,6-diisopropylphenylimido neophylidene molybdenum (VI) bis-t-butoxide (MoTB) in 0.7 ml of CH2Cl2. The catalyst solution was applied to sanded EPDM rubber strips that were then bonded to EPDM rubber strips with 0.13 ml of ENB monomer per coupon as described in Example 12. All specimens were analyzed on an Instron using the 180° peel test. The results are means for two separate data sets: the original two unsanded bonded specimens (long residence time in the glove box)—mean load at maximum load of 9.41 (N) and mean energy to break of 0.27 (J) and two new specimens (surfaces were sanded prior to placing in the glove box followed by washing with CH2Cl2 in the box prior to addition of monomer)—mean load at maximum load of 12.97 (N) and mean energy to break of 0.76 (3). No rubber tear was observed on any specimen. EXAMPLE 18 EPDM-to-EPDM Bonding using Homobimetallic Ruthenium Catalyst and ENB. A catalyst solution was prepared by dissolving 0.031 g of RuCl 2(p-cymene)-RuCl2(PCy3)2═CHPh in 3.1 ml of CH2Cl2. The catalyst solution was applied to three EPDM rubber strips that were then bonded to EPDM rubber strips with 0.16 ml of ENB monomer per coupon as described in Example 4. The mated specimens were analyzed on the Instron using a 180° peel test. The bonded specimens had a mean load at maximum load of 126.28 (N) and a mean energy to break of 11.38 (3). Rubber tear was observed for all specimens. EXAMPLE 19 EPDM-to-EPDM Bonding using DCPD as Monomer. A catalyst solution was prepared by dissolving 0.031 g of RuCl 2(PCy3)2═CHPh in 3.1 ml of CH2Cl2. The catalyst solution was applied to three EPDM strips that were then bonded to EPDM strips with DCPD monomer as described in Examples 4 and 14. The mated specimens were analyzed on the Instron using a 180° peel test. The bonded specimens had a mean load at maximum load of 181.75 (N) and a mean energy to break of 26.46 (J). Rubber tear was observed for all specimens. A catalyst solution was prepared by dissolving 0.031 g of RuCl 2(PCy3)2═CHPh in 3.2 ml of CH2Cl2. This solution was applied to three rubber strips that were then self-bonded with ENB monomer (see Tables 4 and 5 for the amount of ENB applied to each specimen) as described in Example 4. Once this catalyst solution had been depleted, another identical batch was prepared and used to bond another three specimens. Both EPDM and natural rubber A225P strips were molded and cured to different extents of cure as shown in Tables 4 and 5. The extent cure is shown as a percentage that was determined on a Monsanto Oscillating Disk Rheometer (for example, T90=time at 90% of maximum torque). Surface pretreatment of both surface types involved washing with acetone. The A225P was sanded while the EPDM remained unsanded. The EPDM was cured at 100, 70 and 40% and the A225P was cured at 100, 90, 70 and 40%. Instron results from the 180° peel test are shown in Tables 4 (EPDM) and 5 (A225P). Amount of Load at Max. A catalyst solution was prepared by dissolving 0.030 g of RuCl 2(PCy3)2═CHPh in 2.5 ml of CH2Cl2. This solution was applied to three strips of four types of Santoprene® (101-64, 201-64, 201-87 and 8201-90), and self-bonded with ENB monomer as described in Example 4. The amount of ENB applied depended on the Santoprene® surface treatment: 0.06 ml for unsanded and 0.16 ml for sanded specimens. Once this catalyst solution had been depleted, another identical batch was prepared and used to bond another three specimens. The bonded specimens were analyzed on an instron with the 180° peel test and the results are shown in Tables 6 and 7. All unsanded samples showed no rubber tear and displayed adhesive failure as a polymer film was observed on much of the rubber surface. All three 101-64 sanded samples showed excellent rubber tear, two 201-64 samples showed excellent rubber tear, and both stiffer rubbers, 201-87 and 8201-90, showed no rubber tear. A catalyst solution was prepared by dissolving 0.031 g of RuCl 2(PCy3)2═CHPh in 3.1 ml of CH2Cl2. Three types of bonding were performed: (1) tread-to-tread (2) carcass-to-carcass and (3) carcass-to-tread. For carcass-to-tread specimens, the catalyst was applied to the carcass and ENB monomer to the tread. The bonding procedure was as described in Example 4. Once the catalyst solution had been depleted another identical batch was prepared. The amount of ENB applied depended on the specimen and is shown in Tables 8 and 9. Mechanical properties were obtained on both unsanded and sanded combinations of carcass and tread stock. The bonded specimens were analyzed on an Instron with the 180° peel test. Table 8 shows data for the unsanded specimens. All unsanded samples showed rubber tear. The tread-to-tread samples showed some superficial rubber tear. The carcass-to-carcass and carcass-to-tread samples showed deep rubber tear. Using Unsanded Carcass and Tread Stocks. Using Sanded Carcass and Tread Stocks. A catalyst solution was prepared by dissolving 0.021 g of RuCl 2(PCy3)2═CHPh in 1.5 ml of CH2Cl2. The catalyst solution was applied to three grit-blasted steel coupons that were then bonded to other grit-blasted steel coupons with 0.02-0.03 ml of ENB monomer per coupon as described in Example 1, except that the monomer was applied to the catalyst coated metal coupon. The other steel coupon was immediately mated to the treated surface and weighted down with a 100 g weight. After three days of sitting at ambient conditions, all three samples could not be pulled apart by hand. The samples were analyzed on an Instron using a lap shear tensile test and showed a mean load at break of 375.99 (N). A catalyst solution was prepared by dissolving 0.040 g of RuC 2(PCy3)2═CHPh in 3.0 ml of CH2Cl2. The catalyst solution was applied to three glass microscope slides that were then bonded to other glass microscope slides with 0.15-0.20 ml of ENB monomer per slide as described in Example 1, except that not all the catalyst solution was used —just a sufficient amount to cover the defined area. The solvent was allowed to evaporate for 3 to 4 minutes before the ENB was pipetted onto the catalyst containing surface. Immediately, the other glass slide was mated onto the other slide and held in place with a 100 g weight. After 1.5 hours, the two glass slides were examined and found to be held together as the substrates could be picked up without falling apart. A catalyst solution prepared from 0.040 g of RuCl 2(PCy3)2═CHPh in 3 ml of CH2Cl2 was applied to a single piece of laboratory filter paper as described in Example 1. The solvent was allowed to evaporate for approximately 2 minutes. ENB monomer was applied to another piece of filter paper. Immediately, the two paper surfaces were mated and held in place with a 100 g weight. After 1.5 hours, the two paper pieces were examined and found to be held together and could not be pulled apart. A catalyst solution was prepared by dissolving 0.75 g of RuCl 2(PCy3)2═CHPh in 25 ml of CH2Cl2. This solution was then spray applied onto a 7.62 cm×15.24 cm substrate surface, which had been previously wiped with acetone to remove any surface contamination, in a sweeping pattern until even-appearing coverage was obtained. The solvent was allowed to evaporate for 30 minutes in the open laboratory atmosphere leaving the surface coated with catalyst. Black Santoprene®, manila Santoprene®, acrylonitrile butadiene styrene (ABS), polypropylene, polymethylmethacrylate (PMMA), aluminum, chromated aluminum, stainless steel, polycarbonate sheet, Delrin acetal resin sheet, Mannington Classic uncoated embossed polyvinyl (PVC) flooring (designated “MC”), and Tarkett/Domco polyvinyl flooring (designated “T”) were sprayed with ENB monomer and allowed to dry. Both static and kinetic coefficients of friction of all the coated specimens were measured by determining drag resistance on an Instron (see P. R. Guevin, “Slip Resistance,” in Paint and Coating Testing Manual Fourteenth Edition of the Gardner-Sward Handbook, J. V. Koleske, ed., ASTM Manual Series: MNL 17, ASTM, Philadelphia, 1995, Chapter 50.) The results are shown below in Tables 10 and 11. For all samples the static and kinetic coefficients of friction were lower after spray coating with ENB compared to the control (e.g., shown in the Table as Aluminum-C) of that sample except in a few cases. Lower static and kinetic coefficients of friction indicate improved surface lubricity. for Metal Substrates Spray Coated with ENB. Substrates Spray Coated with ENB. A catalyst solution was prepared by dissolving 0.75 g of RuCl 2(PCy3)2═CHPh in 25 ml of CH2Cl2. This solution was then spray applied onto the surface of four 7.62 cm×15.24 cm pieces of EPDM, which had been previously wiped with acetone to remove any surface contamination, in a sweeping pattern until even-appearing coverage was obtained. The solvent was allowed to evaporate for 30 minutes in the open laboratory atmosphere leaving the surface coated with catalyst. The samples were then sprayed with ENB monomer and allowed to stand in the open laboratory atmosphere until not tacky. More ENB was applied to EPDM-4 and the sample allowed to dry overnight. The catalyst and resultant polymer levels are reported in Table 14. The increase in coating weight after the second spraying of ENB on EPDM-4 demonstrated that layers of poly(ENB) could be built up on previous a EPDM surface and that the catalyst remained active. A catalyst solution was prepared by dissolving 0.75 g of RuCl 2(PCy3)2═CHPh in 25 ml of CH2Cl2. This solution was then spray applied onto the surface of an ABS specimen (10.16 cm×15.24 cm), which had been previously wiped with isopropanol to remove any surface contamination, in a sweeping pattern until even-appearing coverage was obtained. The solvent was allowed to evaporate for 30 minutes in a fume hood in the open laboratory atmosphere leaving the surface coated with catalyst. The samples were then sprayed with DCPD, with methylidenenorbornene (MNB), and cyclooctene (CO) monomers and allowed to stand in the open laboratory atmosphere for 2.5 hours before weighing. The catalyst and resultant polymer levels are reported in Table 15. Coefficient of friction data and cross-hatch adhesion data are reported in Tables 15 and 16, respectively. For the cyclooctene specimen, no polymer formation was observed; the cyclooctene appeared to volatilize from the surface. Monomers Spray Applied to ABS. A catalyst solution was prepared by dissolving 0.1692 g of 2,6-diisopropyl-phenylimido neophylidene molybdenum (VI) bis-t-butoxide (MoTB) in 5 ml of CH 2Cl2. The catalyst solution was applied to a 10.16 cm×15.24 cm ABS substrate in the glove box as described in Example 12. The catalyst thickened and the surface roughened with thick brush marks because the solvent dissolved the ABS surface. Using a pipette, ENB monomer was applied in front of a 1 mil draw down bar and the bar was pulled down across the catalyst coated area. Upon attempting to draw down the bar a second time, the newly formed coating scratched because the monomer polymerized so quickly. This gave a wrinkled, dark brown coating in the catalyst coated area and a chalky yellow edge were the ENB monomer did not touch. To eliminate this surface dissolution problem, another MoTB catalyst solution (0.1192 g of MoTB in 3 ml CH 2Cl2) was again applied to a surface, but this time to a 10.16 cm×15.24 cm chromated aluminum (AC) substrate. A more uniform coating of poly(ENB) formed on the surface. The chromated alumina coated specimen (AC) showed a static coefficient of friction of 0.44±0.03 and a kinetic coefficient of friction of 0.14±0.05. These data were obtained for the AC specimen only as the ABS surface was too rough as described above. Cross-hatch adhesion data for both specimens are reported in Table 17. A matrix solution was prepared (2 g of PMMA, 0.1 g of RuCl 2(PCy3)2═CHPh, and 50 ml of CH2Cl2) and applied by spray application to a PMMA substrate. The coating was not uniform so three to four drops of the above matrix solution were applied to the PMMA substrate and spread out using a glass rod. On drying, a clear uniform coating formed which was sprayed with ENB. No change in surface tension was observed before and after spraying ENB on the PMMA/RuCl 2(PCy3)2═CHPh matrix described above (γ=38 dynes/cm). More RuCl2(PCy3)2═CHPh was added to the PMMA/RuCl2(PCy3)2═CHPh matrix thus bringing the total to 0.35 g catalyst in the PMMA matrix. This new solution was coated onto new 5.08 cm×5.08 cm PMMA substrate, dried, and then sprayed with ENB. The surface tension remained 38 dynes/cm. Again, another addition of catalyst brought the new total to 0.55 g RuCl2(PCy3)2═CHPh in the PMMA matrix. This surface, which was processed as described above, displayed a surface tension of 34 dynes/cm. This result demonstrated that the catalyst remained active when incorporated into a polymer matrix and that coatings can be applied over this active surface. A solution containing 0.25 g of RuC 2(PCy3)2═CHPh in 15 ml of CH2Cl2 was sprayed onto a 10.16 cm×15.24 cm PMMA substrate surface to provide 0.0384 g of catalyst onto the surface on drying. The overcoat PMMA/ENB matrix (2 ml of ENB, 1 gm of PMMA, in 10 ml of CH2Cl2) was applied by glass rod to the catalyst coated surface and the resulting surface tension was 46 dynes/cm). This compares to a surface tension of 36 dynes/cm for a control uncoated PMMA substrate. Commercial filter paper (Whatman #41) samples were cut into fifteen dogbone-shaped specimens (11 cm overall length, 40×7.2 mm draw area) and spray coated with a solution of RuC 2(PCy3)2═CHPh as described in Example 8. After drying in the laboratory air for 30 minutes, the specimens were weighed, and then five specimens were spray coated with DCPD (5 ml), five specimens were spray coated with ethylidenenorbornene (8 ml), and five specimens were spray coated with cyclooctene (5 ml) on one side of the paper. After drying for 16 hours in the fame hood, the specimens were weighed to determine the amount of reacted monomer and their tensile properties determined on an Instron (Table 18). Poly(ENB) and poly(DCPD) coated paper dog-bones showed increased maximum load values, while poly(cyclooctene) did not. Statistical analysis (t-test) revealed increased displacement at maximum load for DCPD at the 95% confidence level. Little poly(cyclooctene) formed likely as a result of its high volatility vs ROMP rate. Tensile Strength Data for Paper Dog-Bone Specimensa. Kevlar®, Nomex®, and nylon threads (size 69, 0.2032 mm) were cut into 30.48 lengths, soaked in a solution containing approximately 0.04 g of RuCl 2(PCy3)2═CHPh in 5 ml of CH2Cl2 for one minute, and allowed to dry in a straight position. After 20 minutes the threads were sprayed with 8 ml of ENB. After two hours the threads appeared straight and stiff. Tensile properties for these specimens were compared to uncoated threads on an Instron (Table 19). No real differences in tensile data were observed. However, each thread was thicker providing evidence that the threads were indeed coated. Tensile Properties of ENB Coated and Uncoated Threads. Strips of cotton, fiberglass, polyester, and aramid fabric were cut to 2.54 cm×15.24 cm geometries, dipped in a solution containing 1.0 g of RuCl 2(PCy3)2═CHPh in 100 ml of CH2Cl2 for one minute, and allowed to dry. It was noted that excess catalyst wicked to the fabric surfaces during the drying process. The excess catalyst was shaken from each fabric. All fabrics had a purple color showing that catalyst had adsorbed onto the surface. Approximately 30 ml of ENB was sprayed onto both sides of the fabric strips. All fabric samples stiffened as the polymerization occurred. Tensile properties were determined for six of each coated and uncoated specimen on an Instron (Table 20). While stiff, the fabrics could easily be bent like uncoated fabric. Five 15-inch pieces of polyester Nubond size 346 cord were washed in hexanes 10 for 1 hour and dried at 40° C. in vacuum oven for one hour. The cords were weighed and their thicknesses measured with a digital micrometer. A catalyst solution was made by dissolving 0.2 g. of RuCl 2(PCy3)2═CHPh catalyst in 20 ml of CH2Cl2 and placed in a recrystallizing dish. The cords were soaked for five minutes in the catalyst solution and then hung to dry for an hour. The cords were weighed to determine catalyst level and then were dipped in 5-ethylidene-2-norbornene, dicyclopentadiene or bicyclo[2.2. 1]hept-5-en-2-yl-trichlorosilane monomers for 10 seconds and hung to allow polymerization. The coated cords were allowed to sit overnight. This process was repeated with Kevlar and nylon samples, except that the bicyclo[2.2.1]hept-5-en-2-yl-trichlorosilane monomer was not used again. Fiber Adhesion Data for Different Yarns in Natural Rubber A225P. (c) contacting the fibrous substrate surface with a second substrate surface. 2. A method according to claim 1 wherein the fibrous substrate comprises polyester, nylon or polyamide. 3. A method according to claim 2 wherein the second substrate surface comprises an elastomeric substrate. 4. A method according to claim 3 wherein the elastomeric substrate is selected from the group consisting of natural rubber, polychloroprene, polybutadiene, polyisoprene, styrene-butadiene copolymer rubber, acrylonitrile-butadiene copolymer rubber, ethylene-propylene copolymer rubber, ethylene-propylene-diene terpolymer rubber, butyl rubber, brominated butyl rubber, alkylated chlorosulfonated polyethylene rubber, hydrogenated nitrile rubber, poly(n-butyl acrylate), thermoplastic elastomer and mixtures thereof. 5. A method according to claim 3 wherein the elastomeric substrate is natural rubber or ethylene-propylene-diene terpolymer rubber. 6. A method according to claim 1 wherein step (a) comprises soaking the fibrous substrate in a catalyst solution and step (b) comprises dipping the catalyst-soaked fibrous substrate into a metathesizable material and allowing polymerization. 7. A method according to claim 1 wherein step (c) comprises placing the fibrous substrate between two layers of second substrate surface in a mold and curing the second substrate surface with heat and pressure. 8. A method according to claim 1 wherein the catalyst is dissolved or mixed into a liquid carrier fluid. 9. A method according to claim 1 wherein the catalyst is included as a component of the first fibrous substrate. 10. A method according to claim 1 wherein the catalyst is selected from at least one of a rhenium compound, ruthenium compound, osmium compound, molybdenum compound, tungsten compound, titanium compound, niobium compound, iridium compound and MgCl2. wherein M is Os, Ru or Ir; each R1 is the same or different and is H, alkenyl, alkynyl, alkyl, aryl, alkaryl, aralkyl, carboxylate, alkoxy, allenylidenyl, indenyl, alkylalkenylcarboxy, alkenylalkoxy, alkenylaryl, alkynylalkoxy, aryloxy, alkoxycarbonyl, alkylthio, alkylsulfonyl, alkylsulfinyl, amino or amido; X is the same or different and is either an anionic or a neutral ligand group; and L is the same or different and is a neutral electron donor group. 12. A method according to claim 11 wherein X is Cl, Br, I, F, CN, SCN, N3, O-alkyl or O-aryl; L is a heterocyclic ring or Q(R2)a wherein Q is P, As, Sb or N; R2 is H, cycloalkyl, alkyl, aryl, alkoxy, arylate, amino, alkylamino, arylamino, amido or a heterocyclic ring; and a is 1, 2 or 3; M is Ru; and R2 is H, phenyl, —CH═C(phenyl)2, —CH═C(CH3)2 or —C(CH3)2(phenyl). 13. A method according to claim 10 wherein the catalyst is a phosphine-substituted, an imidazolylidene-substituted, or a dihydroimidazolylidene-substituted ruthenium carbene. 15. A method according to claim 1 wherein the catalyst is stable in the presence of moisture and oxygen and can initiate polymerization of the metathesizable material upon contact at room temperature. 16. A method according to claim 1 wherein the metathesizable material is selected from ethene, α-alkene, acyclic alkene, acyclic diene, acetylene, cyclic alkene, cyclic polyene and mixtures thereof. 17. A method according to claim 16 wherein the metathesizable material comprises a cycloolefin. 18. A method according to claim 17 wherein the metathesizable material is a monomer or oligomer selected from norbornene, cycloalkene, cycloalkadiene, cycloalkatriene, cycloalkatetraene, aromatic-containing cycloolefin and mixtures thereof. 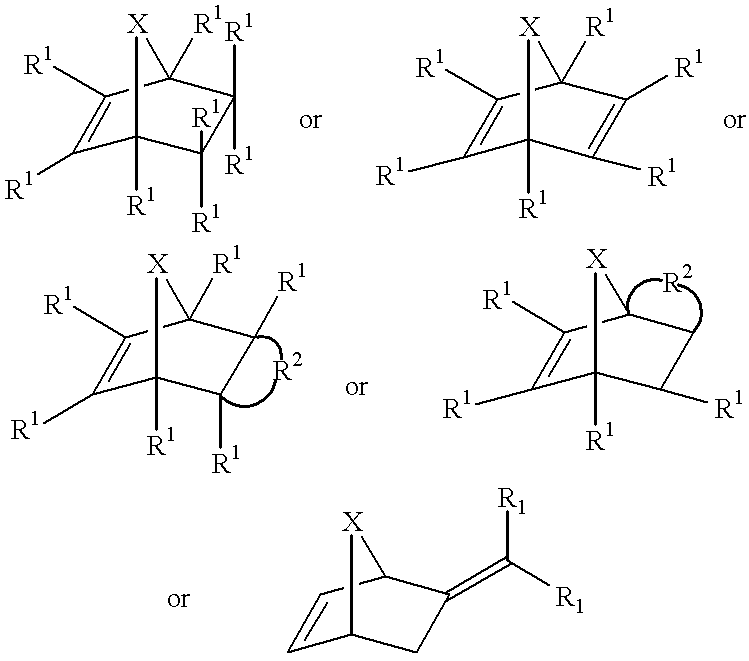 wherein X is CH2, CHR3, C(R3)2, O, S, N—R3, P—R3, O═P—R3, Si(R3)2, B—R3; each R1 is independently H, CH2, alkyl, alkenyl, cycloalkyl, cycloalkenyl, aryl, alkaryl, aralkyl, halogen, halogenated alkyl, halogenated alkenyl, alkoxy, oxyalkyl, carboxyl, carbonyl, amido, (meth)acrylate-containing group, anhydride-containing group, thioalkoxy, sulfoxide, nitro, hydroxy, keto, carbamato, sulfonyl, sulfinyl, carboxylate, silanyl, cyano or imido; R2 is a fused aromatic, aliphatic or heterocyclic or polycyclic ring; and R3 is alkyl, alkenyl, cycloalkyl, cycloalkenyl, aryl, alkaryl, aralkyl or alkoxy. 20. A method according to claim 17 wherein the metathesizable material comprises ethylidenenorbornene monomer or oligomer, dicyclopentadiene or bicyclo[2.2. 1 ]hept-5-en-2-yl-trichlorosilane. (d) curing said composite material. 23. A method according to claim 22 wherein X is Cl, Br, I, F, CN, SCN, N3, O-alkyl or O-aryl; L is a heterocyclic ring or Q(R2)a wherein Q is P, As, Sb or N; R2 is H, cycloalkyl, alkyl, aryl, alkoxy, arylate, amino, alkylamio, arylamino, amido or a heterocyclic ring; and a is 1, 2 or 3; M is Ru; and R1 is H, phenyl, —CH═C(phenyl)2, —CH═C(CH3)2 or —C(CH3)2(phenyl). 24. A method according to claim 21 wherein the catalyst is a phosphine-substituted, an imidazolylidene-substituted, or a dihydroimidazolylidene-substituted ruthenium carbene. tricyclohexylphosphine[ 1,3-bis(2,3 ,6-trimethylphenyl)-4,5-imidazol-2ylidene][benzylidene]ruthenium (IV) dichloride. 26. A method according to claim 21 wherein the metathesizable material comprises a cycloolefin. 27. A method according to claim 26 wherein the metathesizable material is a monomer or oligomer selected from norbornene, cycloalkene, cycloalkadiene, cycloalkatriene, cycloalkatetraene, aromatic-containing cycloolefin and mixtures thereof. 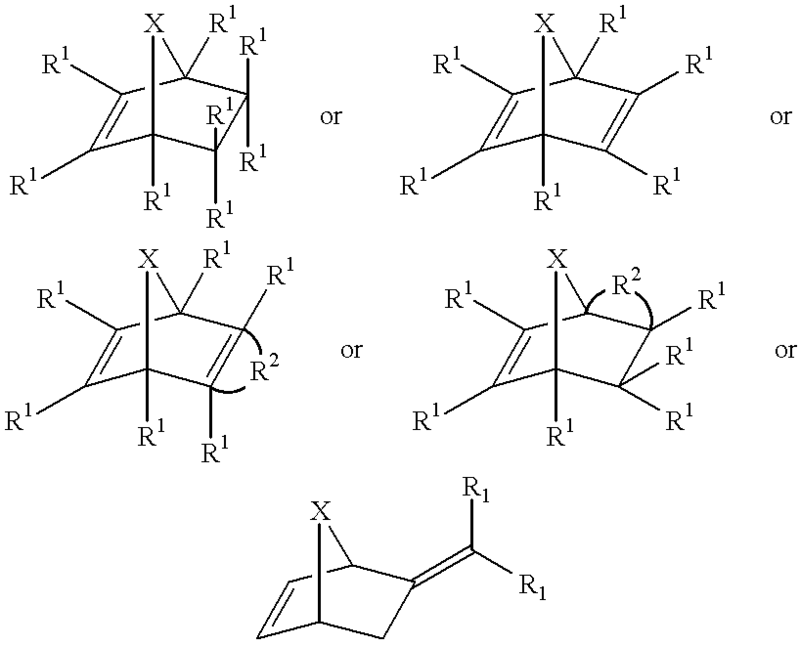 wherein X is CH2, CHR3, C(R3)2, O, S, N—R3, P—R3, O═P—R3, Si(R3)2, B—R3 or As-R3; each R1 is independently H, CH2, alkyl, alkenyl, cycloalkyl, cycloalkenyl, aryl, alkaryl, aralkyl, halogen, halogenated alkyl, halogenated alkenyl, alkoxy, oxyalkyl, carboxyl, carbonyl, amido, (meth)acrylate-containing group, anhydride-containing group, thioalkoxy, sulfoxide, nitro, hydroxy, keto, carbamato, sulfonyl, sulfinyl, carboxylate, silanyl, cyano or imido; R2 is a fused aromatic, aliphatic or heterocyclic or polycyclic ring; and R3 is alkyl, alkenyl, cycloalkyl, cycloalkenyl, aryl, alkaryl, aralkyl or alkoxy. 29. A method according to claim 26 wherein the metathesizable material comprises ethylidenenorbornene monomer or oligomer, dicyclopentadiene or bicyclo [2.2.1 ]hept-5-en-2-yl-trichlorosilane. 30. A method according to claim 21 wherein the fibrous substrate is polyester, nylon or polyamide. 31. A method according to claim 30 wherein the second substrate surface is selected from the group consisting of natural rubber, polychloroprene, polybutadiene, polyisoprene, styrene-butadiene copolymer rubber, acrylonitrile-butadiene copolymer rubber, ethylene-propylene copolymer rubber, ethylene-propylene-diene terpolymer rubber, butyl rubber, brominated butyl rubber, alkylated chlorosulfonated polyethylene rubber, hydrogenated nitrile rubber, silicone rubber, fluorosilicone rubber, poly(n-butyl acrylate), thermoplastic elastomer and mixtures thereof. 32. A method according to claim 31 wherein the elastomeric substrate is natural rubber or ethylene-propylene-diene terpolymer rubber. 33. A method according to claim 21 wherein steps (a) and (b) take place at room temperature. 34. A manufactured article produced by the method of claim 1. 35. A manufactured article comprising a fibrous substrate sandwiched between and bonded to a second substrate surface and a third substrate and an adhesive layer interposed between the fibrous substrate and the second substrate and the third substrate wherein the second and third substrate comprise a rubber material and the adhesive layer comprises a metathesis polymer. comprises a metathesis polymer. 37. A manufactured article according to claim 35 wherein the metathesis polymer is produced from a norbornene monomer comprising ethylidenenorbornene, dicyclopentadiene or bicyclo[2.2. 1 ]hept-5-en-2-yl-trichlorosilane. (b) contacting the catalyst on the fibrous substrate with a material that undergoes a metathesis reaction to form a coating on the fibrous substrate. 39. A method according to claim 38 wherein the catalyst is included as a component of the fibrous substrate. 40. A method according to claim 38 wherein the catalyst is selected from at least one of a rhenium compound, ruthenium compound, osmium compound, molybdenum compound, tungsten compound, titanium compound, niobium compound, iridium compound and MgCl2. 42. A method according to claim 41 wherein X is Cl, Br, I, F, CN, SCN, N3, O-alkyl or O-aryl; L is a heterocyclic ring or Q(R2)a wherein Q is P, As, Sb or N; R2 is H, cycloalkyl, alkyl, aryl, alkoxy, arylate, amino, alkylamino, arylamino, amido or a heterocyclic ring; and a is 1, 2 or 3; M is Ru; and R1 is H, phenyl, —CH═C(phenyl)2, —CH═C(CH3)2 or —C(CH3)2phenyl). 43. A method according to claim 40 wherein the catalyst is a phosphine-substituted, an imidazolylidene-substituted, or a dihydroimidazolylidene-substituted ruthenium carbene. 45. A method according to claim 38 wherein the metathesizable material is selected from ethene, α-alkene, acyclic alkene, acyclic diene, acetylene, cyclic alkene, cyclic polyene and mixtures thereof. 46. A method according to claim 45 wherein the metathesizable material is a monomer or oligomer selected from norbornene, cycloalkene, cycloalkadiene, cycloalkatriene, cycloalkatetraene, aromatic-containing cycloolefin and mixtures thereof. 47. A method according to claim 38 wherein the metathesizable material comprises ethylidenenorbornene, dicyclopentadiene or bicyclo[2.2. 1]hept-5-en-2yl-trichlorosilane. 48. A method according to claim 38 wherein the fibrous substrate is fiberglass, polyester, polyamide or cotton.